I enjoyed reading Dawkins' classic, The Selfish Gene. I especially liked the descriptions of various symbiotic relationships. I found the speculation about how symbiosis might have contributed to early life evolving into complex forms to be interesting and I wish that part was expanded more. I'm not sure exactly why, but, while reading the book, I was reminded of a print we had up in our family room when I was a kid. 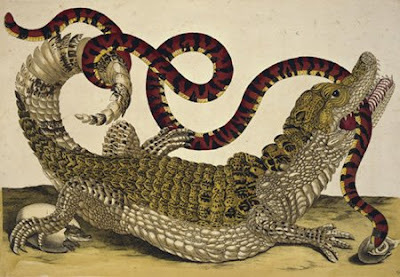 It's Dwarf Caiman and False Coral Snake (from The Insects of Suriname, 1719) by the botanical artist, Maria Sibylla Merian.